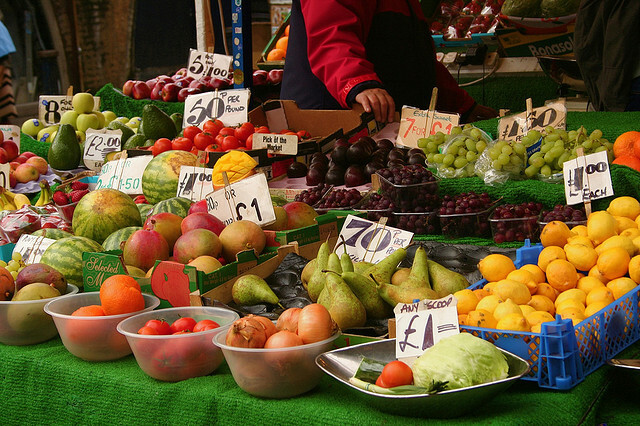 Fruit and vegetables in the market in Brixton, London, in which citizens have launched a 'transition' initiative, in which residents aim for social, fiscal and ecological sustainability. [Flickr]. Academics say there are limits to blaming European citizens for their high levels of consumption, arguing that a societal shift is necessary for the continent to achieve a sustainable ecological footprint. European consumption patterns have changed dramatically over the past 50 years, thanks largely to increasing incomes, economic globalisation, technological advancements and cultural shifts. While the shift may have brought many benefits, such as the greater availability of information and a number of goods and services, the increased use of resources has led to ecological crises. The average European uses approximately four times more resources than one in Africa, and three times as much as one in Asia. However, Europeans still use just half the resources of a person in the United States, Canada and Australia. Olivier de Schutter, a Belgian academic and UN official, convened the conference with the intention of debating how European institutions can facilitate a transition to sustainable societies. Last year, De Schutter won the Francqui Prize, one of Belgium’s most prestigious science prizes, for his work on how law and governance can contribute to the quality of life. The conference was named The EU’s Fifth Project: Transitional Governance in the Service of Sustainable Societies. “So transitional governance is, really, a question of which levers could be used in order to make the transition towards sustainable societies happen,” he told EURACTIV in an interview before the conference, which took place on Thursday and Friday last week (8 and 9 May). Europeans have been increasingly encouraged in recent years to “green” their lifestyles, with the EU launching a number of initiatives on reducing waste, such as plastic bag use, recycling, saving water and increasing their use of public transport. Many of these initiatives have only come in recent years, according to the European Environment Agency, as a result of evidence demonstrating the ecological destruction caused by large-scale consumption. The average EU citizen’s resource use rpse by 9.1% between 2000 and 2007, the EEA says. The increase is largely due to societal or cultural influences and pressures, researchers argue. “It is not fair or constructive to put the consumer in the focus”, said Guliz Ger, a researcher with Bilkent University in Ankara, Turkey, adding that definitions of “normality” had shifted, contributing to changes in consumer behaviour. “A normal bathroom did not have a sculpture 50 years ago in Europe,” she said, adding that external factors, such as a US television series, could contribute to altering consumption patterns. She also cited washing habits, such as frequent showers, as a societal shift that had led to the depletion of resources. “People used to bathe. Habits have changed dramatically,” said Ger, who conducts research on consumption patterns and transitional societies and groups. While the average European’s demand for resources has increased, so has supply, with huge numbers of goods making their way into the market every year, many of which are wasted. Food waste is often cited as an example of unsustainable consumption habits. The Commission estimates that 89 million tonnes of food goes to waste each year in the European Union. This may represent up to 50% of edible food. However, many other products, such as electronics and plastic containers, are discarded with increasing frequency. “Consumption is one side of the coin, production the other,” said Alexandre Affre, the industrial affairs director of BusinessEurope, the largest association of European businesses. “We have to maintain in Europe a strong industrial base, instead of importing from other countries,” he said, arguing for greater resource efficiency. “The evidence is showing that we should consume less and consume better,” he said. Analysts also said that one of the drivers of unsustainable consumption may be the way societal progress is measured, mostly using the economic indicator Gross Domestic Product (GDP). “In Europe, our resource-intensive economy was shaped in an era when resources could be bought cheaply or even used for free … Increased resource use had its parallel with economic growth. And still today we haven’t moved really beyond GDP as an indicator of our progress,” said Poto?nik, in a video address. Poto?nik’s environment directorate is preparing a circular economy package, including a review of legislation and targets related to marine litter, construction, demolition, food and plastic waste. Resource-efficiency is one of the seven flagship initiatives in the 'Europe 2020' strategy for sustainable growth and jobs, endorsed by EU heads of states in 2010. The European Commission unveiled its Roadmap to a Resource Efficient Europe in September 2011, recommending the introduction of resource-efficiency indicators and targets across the 27-nation bloc – on land, water and material use. The European Commission’s environment directorate is now working on a series of measures to boost Europe’s resource efficiency and the so-called ‘circular economy’ due for publication in the spring of 2014. European Environment Agency: Unsustainable consumption - the mother of all environmental issues?